To start this night sightseeing through lightened streets of Linz, we will meet you either at the bus parking area near the bank "Oberbank", either in another place that you prefer, in Linz. Comfortably seated in our bus, minibus or car, we will discover together many monuments such as the parish church, the New Cathedral of Linz and the illuminated windows of Linz's stores. Then, we will pass the stadium up the Freinberg's hill where we get off our vehicle a short time to take advantage of a panoramic view of Linz during the night. 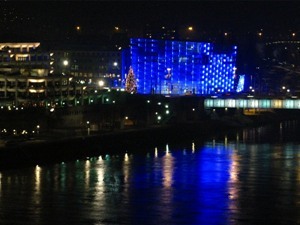 Afterwards, we will go to the "Landestheather" and on the central square "Hauptplatz" of Linz. We will leave our vehicle on the square to take a walk until the hotel "Schwarzer Bär"" (black bear) where we will take the elevator to go to the top of the roof, on the roof terrace. In the birth house of Richard Tauber, we will listen to recordings of the most famous tenor of Linz and we will taste a little glass of cider typically from Linz. Our tour will end like this, and you will have the opportunity to enjoy longer the restaurant of the hotel, or to continue your discovery of the night life of Linz. Linz Tours is a service offered by the tour operator City Tours, a company specialized in creation and organization of touristic sightseeing tours in Austria. You will find more information about Linz Tours and City Tours by clicking on the button entitled "legal notice". Besides, you can get information about our partners and about other sightseeing tours offered by City Tours.